It goes without saying these days that many mobile devices in the market do happen to make use of USB as a charging option. In fact, it would be remiss if that were not the case. 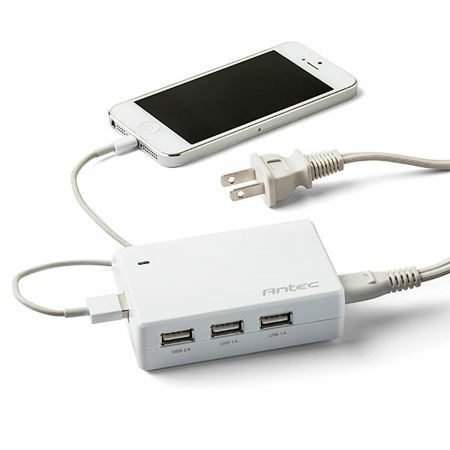 Having said that, instead of carrying around three or four chargers just to handle three or four mobile devices whenever you hit the road, how about settling for the $24.99 Antec 4-Port USB Charging Station? This particular device, as its name does imply, will be able to simultaneously charge up to a quartet of devices. Of course, this is not the first of its kind in the market, but it is a vast improvement over the other versions from various manufacturers. As for the number of USB ports that are available, you will be able to find a pair of 2A as well as an equal number of 1A USB ports, delivering a total output of 5A to ensure that your power hungry devices will be able to get their batteries charged up in order to meet another day’s challenge head on. This is certainly ideal and convenient to carry around, as it does not add too much weight to your luggage when you travel. Other features of the Antec 4-Port USB Charging Station include over voltage protection, short circuit protection, and over current/temperature/power protection.